This is the best chicken. Seriously. It is the best. The skin is crisp and the meat is oh so tender yet incredibly flavorful. I have been wanting to use buttermilk since it was featured in the NYTimes and this week I concocted two dishes featuring the creamy, tangy liquid. I’m now hooked. The best part of this impressive chicken is that it cooks in 30 minutes. Brine the meat the day before (a minimum of 2 hours is required, but 24 hours is ideal) than pop in the oven when you get home from work. 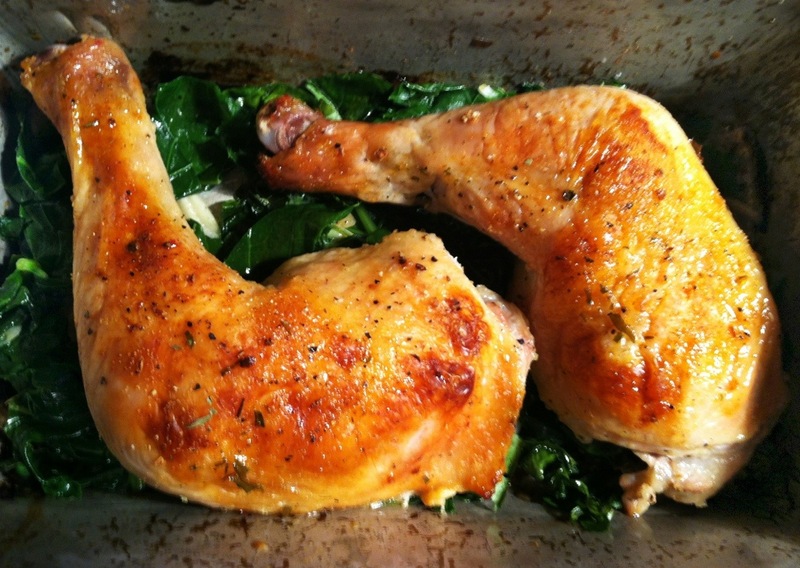 Throw lots of hearty greens under the chicken as it roasts for a complete meal. 1. Whisk together buttermilk, garlic powder, 2 teaspoons of salt and 1 teaspoon of pepper. 2. Place chicken in a large zip lock bag then pour in buttermilk so chicken parts are totally covered. Refrigerate for at least 24 hours but no longer than 48 hours. 3. When ready to roast the chicken, preheat oven to 425 degrees. 4. Remove chicken from buttermilk brine and arrange in baking pan, skin side up. Coat with olive oil and lemon juice, then sprinkle with paprika, tarragon and remaining salt and pepper. Roast for 30 minutes (for legs; approximately 35 to 40 for breasts), until nicely browned. Serve immediately.